Shihezi City is located in central northern part of Northwest China's Xinjiang Uygur Autonomous Region, about 150 kilometers northwest of Urumqi. It lies below the northern foothills of the Tian Mountains on the southern fringe of the desert in the Junggar Basin. Some 50 years ago, there was little here but a vast stretch of desert. At the time, it was home to just a handful of families eking out a living, mostly by herding. The year 1949 saw Xinjiang's peaceful liberation. In 1950 the People's Liberation Army stationed units -- called the Xinjiang Production and Construction Corp -- here, with the mission to consolidate border defense and accelerate Xinjiang's development. To reduce the economic burden on the local government and people, the units started work on large-scale production and construction projects. Since then they have cultivated and developed the area while keeping the borders secure. Over the past 50 years, the Corp has left its pioneering footprints all across the area. Now known as "a shining pearl in the Gobi Desert," Shihezi City never fails to surprise the guests with its expanse of green in China's dry northwest. 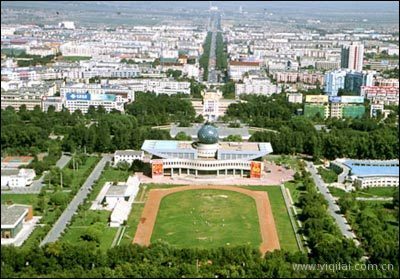 With clean tidy streets in the midst of all the greenery of the trees and with the flowers in bloom, it really is hard to associate this green city with the Gobi desert. Hence, Shihezi City is known as the "manmade oasis in the desert." Greenery now clothes 42 percent of the 460-square-kilometer city, which is home to some 620,000 people. With its wealth of trees and flowers, it is well known as a garden city and highly regarded for the care it devotes to the ecology. In 2000, it won the Dubai International Award for Best Practices in Improving the Living Environment. It is a new and modern city, with the set-up of a number of modern industrial, mining, and commercial enterprises, together with schools, hospitals, and other institutions. There are such tourist attractions as the Monument to Premier Zhou Enlai, North Lake Park, and Desert Park, and so on.